Just about a five-hour drive from the busy City of Manila is a hidden wonder the Philippines is very proud of. Located in Alaminos, in the province of Pangasinan, is the Hundred Islands National Park. It is the First National Park in the Philippines and Southeast Asia. Famous for it’s 123 little islets, some of which are still uninhabited, it is absolutely a natural wonder. The islands are believed to be two million years old. Beautiful sparkling emerald green waters surround it. The water shines on nice sunny days. To get to the Hundred Islands, you have to rent a boat from Lucap Wharf in Alaminos. For a round trip boat ride, you’ll pay PhP400 (Philippine Peso) for up to 10 passengers. The entrance fee to the park is PhP10. At the Hundred Islands, you will find giant clams, also known as Taklobos to locals. It is almost one meter long and weighs about 225 kg. About 10 caves have been discovered on some of the islands. They were named after rock formations and local myths. It is home to beautiful and colorful coral reefs. Out of the many islands, only three are developed, that includes the Governor’s Island, Quezon Island and the Children’s Island. They are trying to preserve the beauty of each of the islands, so the development is minimal. They offer picnic huts and tables, restrooms, some huts and a cottage for overnighters. Everything is pretty basic. 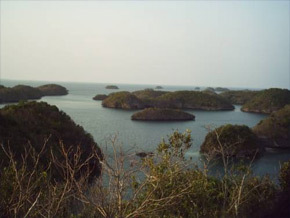 Some of the activities to do when visiting the Hundred Islands National Park include: snorkeling, island hopping, swimming and fishing. To protect the environment some islands are off limits for activities. If you just want a relaxing day to embrace nature at it’s best, the Hundred Islands National Park is a must-see tourists attraction in the Philippines.